I have been an armchair permaculturalist for many years, leafing through photographs of dirt lots transformed into gardens of eden, dreaming of one day turning my yard into a thriving ecosystem of gourmet stature. This Spring I committed to taking my dream out of the house and into the yard. 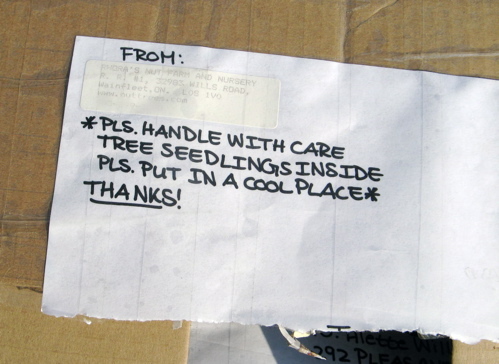 Yesterday my six trees arrived in a cardboard box, packed with damp shredded newspaper, postmarked the day before. As per the instruction sheet I rushed to get them into the ground, mixing the innoculant with the soil as I went and watering them deeply when I was finished. I was a bit nervous about last night’s sub-zero temperatures, but aside from one of the elders, the trees seem to be unscathed. If all goes well my six trees will grow up and in a few years they’ll start bearing fruit and there will be one more local source of food for my household and the households of my furred and winged neighbour. I am thinking of a small tree for the front yard though… must check this site out. Thanks for sharing this wonderful idea. We’ve been living in our present house(Ottawa) for nine years. We inherited a mature apple tree, and have planted pear, crab apple, blackberry, gooseberry and rhubarb. Of these only the blackberry has not done really well. The gooseberries are a revelation- several pounds of fruit the first year, and a constant and helpful habit of self-rooting the drooping branches. The birds love them, too. Oh, and they taste so good! All our purchases were made locally and cheaply. I’d love to add a nut tree, but no room at present. Yes ! As Joni said, we’ve got to get back to the garden. I think it also makes one more aware of what gets put into the ground, water & air because we end of up eating it. I’m really curious to know how your Swiss stone pine is doing almost 5 years later… I’m trying some permaculture down by Gananoque, and looked at Rhora’s page for nut-pines. Any success with the tree?